Editor/Author Agnihotri, Raj and Rapp, Adam A. As we move deeper into the 21st century, firms continue to struggle with the implementation of sales force technology tools and the role they play in sales representative performance. Foreseeing a changing environment, many sales organizations have begun to focus on technology-related strategies, business processes, and applications to adapt to these emerging issues. With this in mind, sales force technology usage has changed the methods of selling. Salespeople are no longer selling just a "product"; instead, they are providing a valuable "solution" to customer problems. Salespeople now act as consultants or experts and provide customized solutions. This role requires salespeople to develop a technological orientation to access, analyze, and communicate information in order to establish a strong relationship with customers. Sales technology enables salespeople to answer the queries of customers and effectively provide competent solutions. The ability to answer queries and provide solutions leads to strong relationships between a salesperson and a customer. Thus, technology tools are not only used for smoothing the work process, but also have strategic utilizations. With the adoption of technological tools at exponential rates, many firms fell into pitfalls and witnessed failure of their technology initiatives. 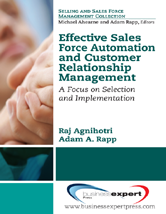 The purpose of this book is to outline the important steps that must be considered and adhered to when implementing sales force technology. Perhaps the most important aspect covered within this book is that technology usage is both a strategy and a tool; therefore, we outline both strategic considerations as well as implementation procedures throughout each chapter. It is important to consider all the steps and the necessary actions that will need to take place before the first penny is spent; then and only then will the technology have its intended effect.